From the Scenarios module, you can map out and validate user navigation flows. Components – elements you can use to build a scenario. Choose from Action, Screen, Decision, Note and Image. Scenarios – a list of all the scenarios you’ve created. You can select different scenarios to view here. 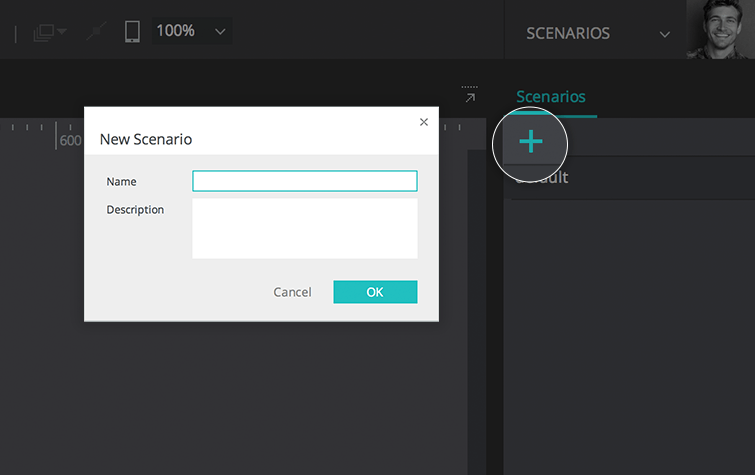 To create a new scenario, click the ‘+’ icon in the Scenarios palette. Here, you will also see a list of all the scenarios you’ve created. If you want to open a scenario, just double click on it. In the Components palette, you’ll find all the available components you can use to create a scenario. Drag and drop them to the canvas to create a scenario. You can also use existing screens in your prototype to create scenarios, listed in the Screens palette of the Scenario module. To use one, simply drag and drop it to the scenarios canvas. Once your scenario components are on the canvas, you can link them to one another and create navigation flows, using the transition arrow option in the toolbar. Click on the transition arrow and the cursor will take the shape of an arrow. 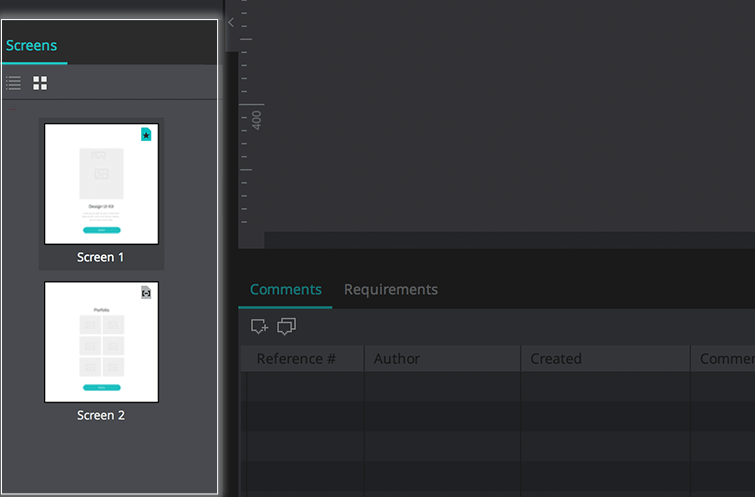 You can now start creating links between components by drawing arrows between components. These navigation flows will be validated. 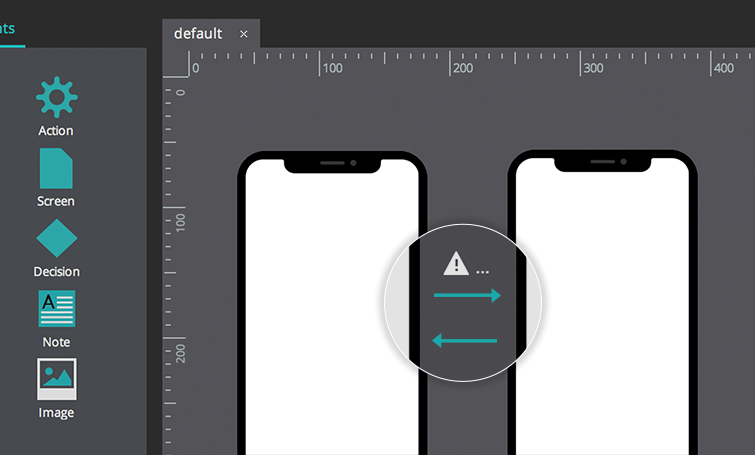 When two components are linked by an arrow and both are UI elements taken from real screens, a warning symbol will appear. This warning symbol indicates that there is no link in the first screen to create the navigation described by the arrow. If you create a link and return to the scenario, the warning symbol will disappear. All information in the scenarios can be exported to a Word document with all the extra information relative to the scenarios. You can start defining a prototype by diagramming in the Scenarios module. To do so, right-click on a scenario screen to create a new screen in the user interface module. You will automatically be taken to the screen in the User Interface. 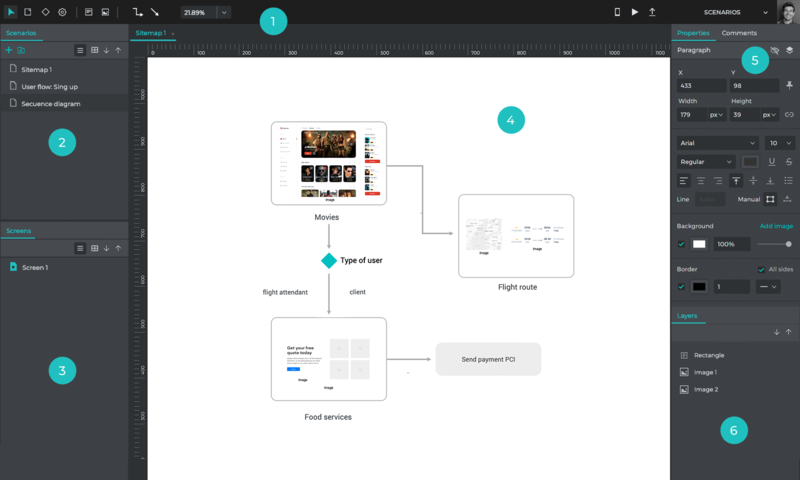 Now, you can define the content and interaction of the screens to flesh out the navigation flow. 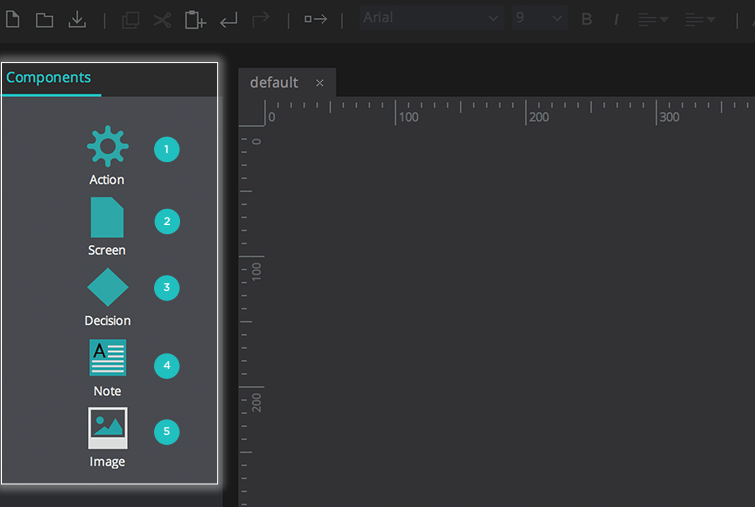 Each time you create a new screen in a scenario, this screen is available with the same name in the User Interface module. Note that a thumbnail preview of the screen will be displayed, instead of an icon. With your scenario created, go to the User Interface module and click “Simulate”. In the Simulation mode window that appears, click on the hamburger menu in the top right-hand corner. A slide menu will appear with two tabs: “Screens” and “Scenarios”. Go to the “Scenarios” tab and select the scenario that you wish to simulate. In the simulation canvas, click on the component where you defined the beginning of your navigation flow. In the pop up that appears, click “Start scenario simulation”. Note: if you want to simulate this particular screen without the scenario, click “Go to screen” to be taken to the screen without the corresponding scenario. You can also add and view comments in the Scenarios module and to simulated scenarios. 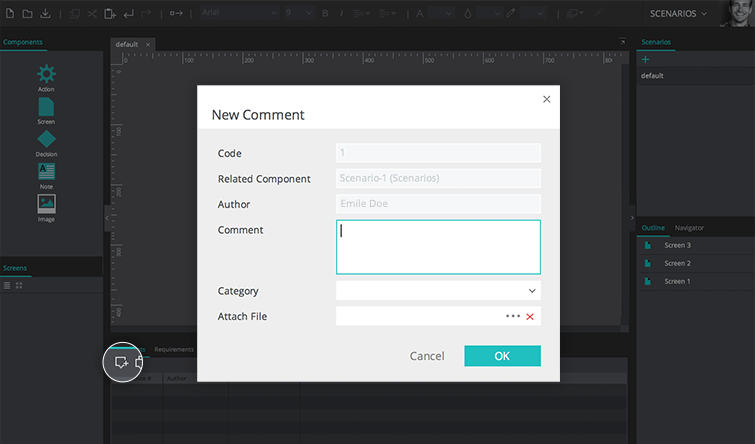 Comments can only be added to the full scenario screen, not specific simulation components.